What is minimally invasive and laparoscopic surgery? Minimally invasive surgery refers to the types of surgery that involve very small or no surgical incisions compared to open procedures which require much bigger skin incisions. As the name suggests they aim to perform the type of surgery required with the minimal amount of injury to the body tissues resulting in a number of benefits for the patient compared to traditional open surgery. Laparoscopic surgery is a type of minimally invasive procedure which has been around for decades. The development of new and innovative technology though has transformed its use and made it more available, constantly pushing the boundaries of what type of procedures can be undertaken using this approach. Dr Markides is a very experienced laparoscopic surgeon performing a very wide range of laparoscopic procedures, including but not limited to laparoscopic bowel resections, laparoscopic hernia repairs, laparoscopic cholecystectomies, laparoscopic appendicectomies and laparoscopic prolapse repairs. Laparoscopic procedures are performed under a general anaesthetic (while you are unconscious). In the abdomen, the operations take place through small incisions, 0.5-1cm typical size, through which gas is inflated in order to create space and make internal organs easy to see. A long thin tube with a tiny camera at the tip (laparoscope) is then inserted into the abdomen which provides magnified views from different angles on a screen allowing the surgeon to perform more detailed surgery compared to open surgery. Further long specialised laparoscopic instruments are also inserted under guidance though the small incisions into the abdomen and are used to perform the relevant procedure. Robotic surgery in general and colorectal surgery is a form of laparoscopic surgery. The only difference being that instead of the surgeon holding the laparoscopic instruments directly with his hands these are attached to mechanical extensions (robotic arms). In their turn these robotic arms are controlled by the surgeon from a different piece of machinery away from the operating table. The second main difference is that the ends of the laparoscopic instruments used in robotic surgery are more flexible than the ones used in laparoscopic surgery. At the moment medical studies in general and colorectal surgery indicate that the benefits to the patient from robotic surgery are similar to those from laparoscopic surgery. Dr Markides has received training in both laparoscopic and robotic surgery and will be happy to explain the best approach for your type of surgery. Other types of minimally invasive operations include procedures such as the Transanal minimally invasive surgery (TAMIS) for rectal lesions, Doppler guided haemorrhoidal artery ligation for haemorrhoids, endolaparoscopic polyp resections and endoscopic component separation for complex hernia repairs, all of which are offered by Dr Markides. What are the benefits of laparoscopic and minimally invasive surgery? In hernia surgery laparoscopy allows the surgeon to repair a recurrent hernia avoiding previous scar tissue from a previous open repair and it is the number one choice for repairing inguinal hernias in both groins at the same time. Bowel cancer laparoscopic surgery performed by an experienced laparoscopic surgeon is at least as safe and effective in removing the cancer compared to an open procedure. Compared to radical surgery TAMIS avoids major colorectal bowel surgery with its serious complications, it has no external incisions, it avoids a stoma, is less painful with faster recovery requiring fewer days to be spent in hospital. Is laparoscopic and minimally invasive surgery for everyone? Anyone can undergo a laparoscopic or minimally invasive procedure and certain groups of patients that would not be fit enough or are considered high risk to undergo traditional open surgery may actually be able to undergo this type of surgery. This is especially true for certain groups of patients such as the elderly and overweight or obese patients. On certain occasions though because of previous surgery in the abdomen or depending on the urgency of surgery open surgery may be performed. Is it more expensive compared to open surgery? 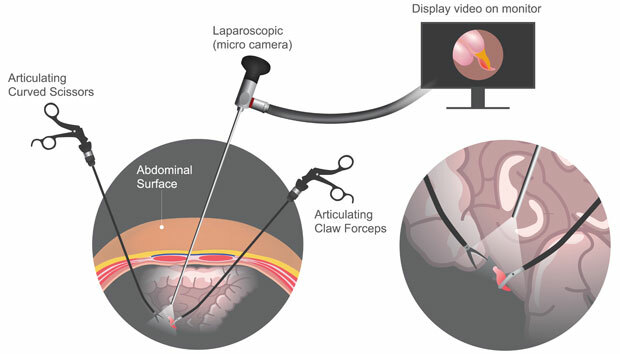 The cost of the equipment tends to be higher in laparoscopic and minimally invasive surgery because of its specialised nature, this type of procedures require a significant degree of surgical expertise to be performed and sometimes they may take slightly longer to perform compared to open surgery. Due to the beneficial effects of these procedures though patients spent less time in hospital, can return to work earlier, have a reduced risk of having any complications with the relevant additional health implications and costs of treatment with time lost away from work. Overall therefore laparoscopic and minimally invasive procedures are at least as cost effective as open procedures and provide an improved quality of care.